Here at Dive CABO are fully committed to protecting our environment. 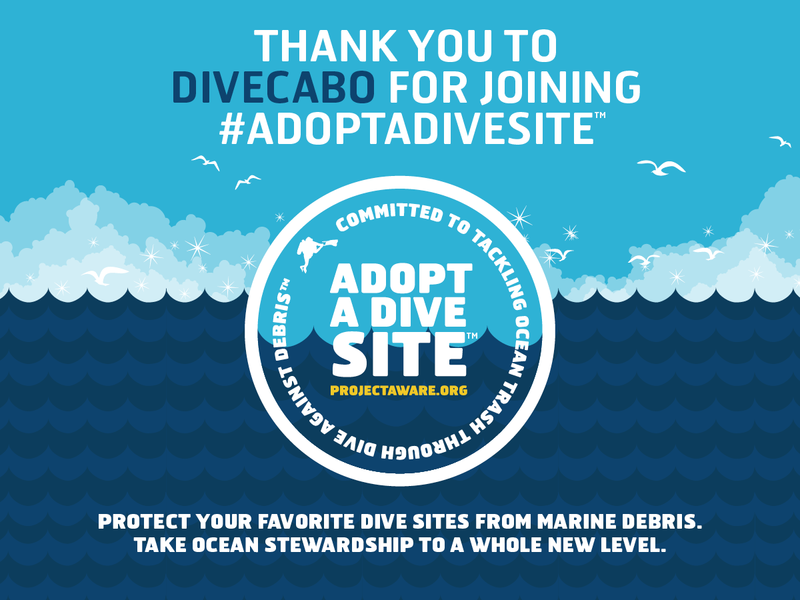 Therefore we are proud sponsors of the Project AWARE “Adopt-a-dive-site”. We proudly report and clean up not just the local dive site, but also represent ourselves on beach clean up and in addition we look for ways of lowering our impact by reducing the number of plastic items we use. most of all, our boats are maintained with environmentally friendly solutions to lower the direct impact on the water ways. Furthermore, guides are mentored and expected to display practices to have little, if any, impact underwater. Marine debris is not only unsightly. It is dangerous to sea life, hazardous to human health and costly to our economies. In addition to fish and other marine animals become entangled in debris and even mistake it for food. Often with fatal results. Especially relevant to divers, swimmers and beach goers can be directly harmed by encounters with marine debris or its toxins. most noteworthy is the environmental damage caused by plastic debris alone is estimated at US$13 billion a year. If you’re a certified diver, you can collect and report important data. Through Project AWARE’s Dive Against Debris, remove marine debris on your dive and report the results. As a result, together we make the ocean safer for marine life, and more importantly, information you report helps inform policy change. Furthermore, with your help, Project AWARE can use the information you report through Dive Against Debris to convince individuals, governments and businesses to act against marine debris. Most of all, protect what you love and join citizens scientists everywhere. Join or lead a Dive Against Debris survey today.